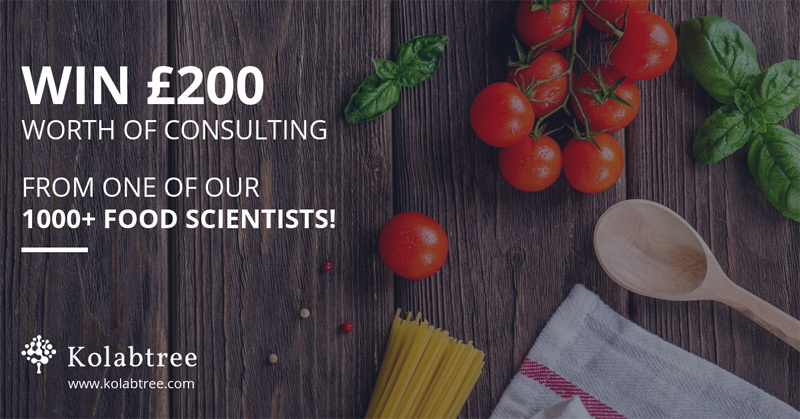 You are at:Home»Food Science»Win £200 worth of consulting from a professional food scientist on Kolabtree! The promoter is: Kolabtree Ltd, whose registered office is at Devonshire House, 60 Goswell Road, London EC1M 7AD. Route to entry for the competition and details of how to enter are listed here. Closing date for entry will be 19th December 2018. After this date the no further entries to the competition will be permitted. Complete the entry form on this URL. The prize is as follows: The prize is £200 credited towards the winners Kolabtree account. No cash or other alternatives will be offered.The prizes are not transferable. Prizes are subject to availability and we reserve the right to substitute any prize with another of equivalent value without giving notice. The promoter will notify the winner when and how the prize can be collected.